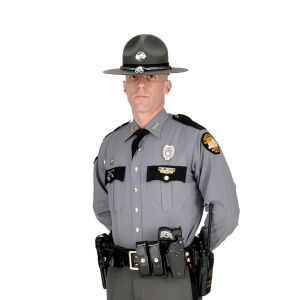 FRANKFORT, Ky. (Feb. 1, 2019) — Kentucky State Police Major Tom Pyzik, a Versailles native, has been promoted to Lieutenant Colonel effective Feb. 1, 2019. 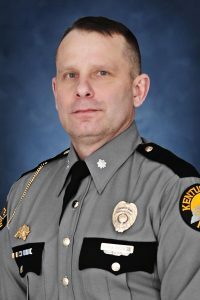 A 19-year veteran of the agency, Pyzik is assigned to KSP headquarters in Frankfort and will serve as director of the Administrative Services Division, which consists of the Operational Support Troop and the Professional Support Troop. The Operational Support Troop includes the Inspections and Evaluations Branch, Strategic Planning Branch, Driver Testing Branch, Recruitment Branch, Academy Branch, Public Affairs Branch, Legislative Security Branch and Facilities Security Branch. The Professional Support Troop includes the Supply Branch, Property Management Branch, Financial and Grants Management Branch and Employee Assistance Branch. He will also be responsible for the Human Resources Branch and the Internal Affairs Branch. A 1987 graduate of Woodford Co. High School and a 1991 graduate of the University of Kentucky, Pyzik is the son of the late Arthur Pyzik and Lorry Pyzik of Versailles, Ky.